Our ice cream maker does not get much attention in the winter. It sits lonely in the pantry, waiting to be remembered. It is not that ice cream is not just as good in the wintertime, but I seem to be busy making other desserts and rarely break it out. So the other day when our first hot days coincided with my son’s case of strep throat, I knew it was time to make some ice cream. The process of making homemade ice cream is simple. 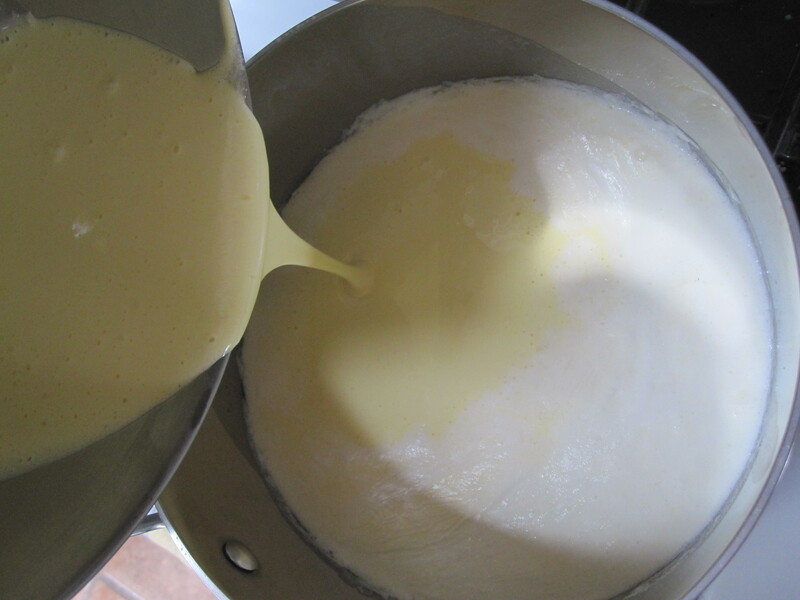 Cream, milk, sugar and eggs cook into a custard. The custard cools and then is poured into the ice cream maker to freeze. The difficult part is making an ice cream that does not have an icy taste. For a long time my go-to recipe was from Christopher Kimball’s The Dessert Bible. It is a great recipe and as usual his descriptions of the process and what can go wrong are extremely helpful. After reading a glowing review on food52 though, I decided to try a new recipe this time. I was not disappointed. This Vanilla Ice Cream is rich and smooth with beautiful bits of vanilla seeds flecked throughout. It did not have the iciness that plagues so many homemade ice creams. Do not be tempted to reduce the fat here. Yes, this is a rich treat, but really you only need a small scoop. Enjoy yourself in moderation. If you really can not find a vanilla bean, you can use 1 teaspoon vanilla extract, but it will not be as good. If you are new to vanilla beans and have questions about how to scrape the seeds, check out Marissa’s great video on Food in Jars. 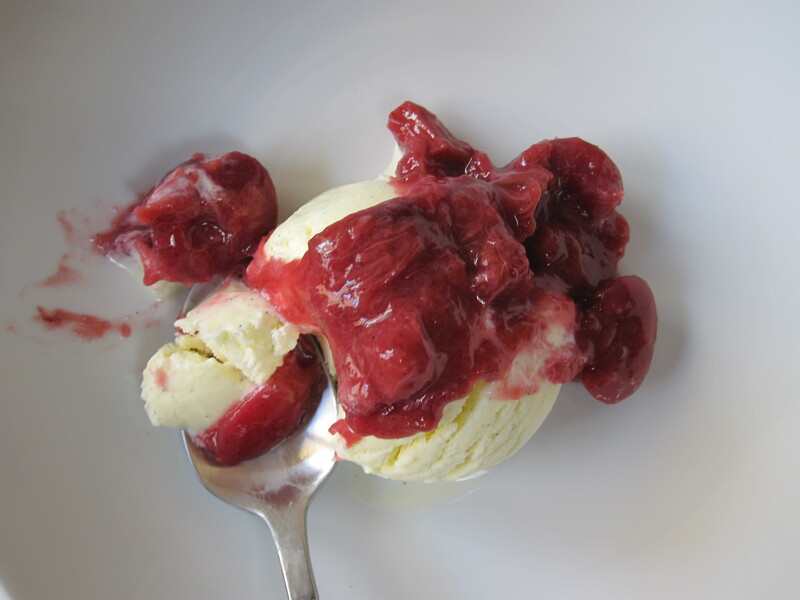 Vanilla Ice Cream is excellent on its own, but with cherries in season, I could not help but whip up a Cherry Rhubarb Sauce for the top. This is a simple sauce, barely sweetened, and perfumed with the vanilla pod reserved from the ice cream. 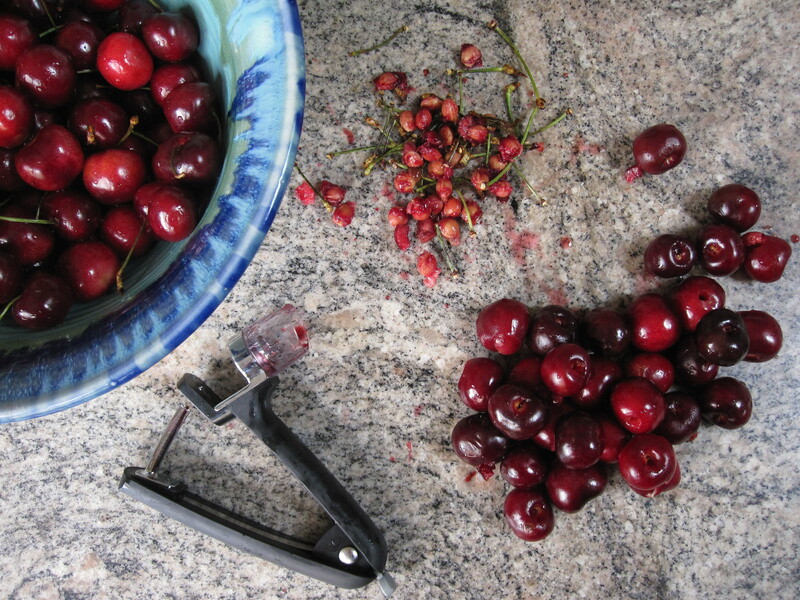 The sweet cherries and tangy rhubarb make delightful partners. The majority of the fruit is cooked down, while some chunks are added at the end for texture. The color is deep and bright and gorgeous. This sauce would also be good on waffles or pancakes. If you are not in the mood for a fruity sauce, try these recipes for chocolate or caramel sauce. Heat cream and milk in a pot to 175 degrees. Meanwhile, beat the egg yolks and sugar on high until light yellow. 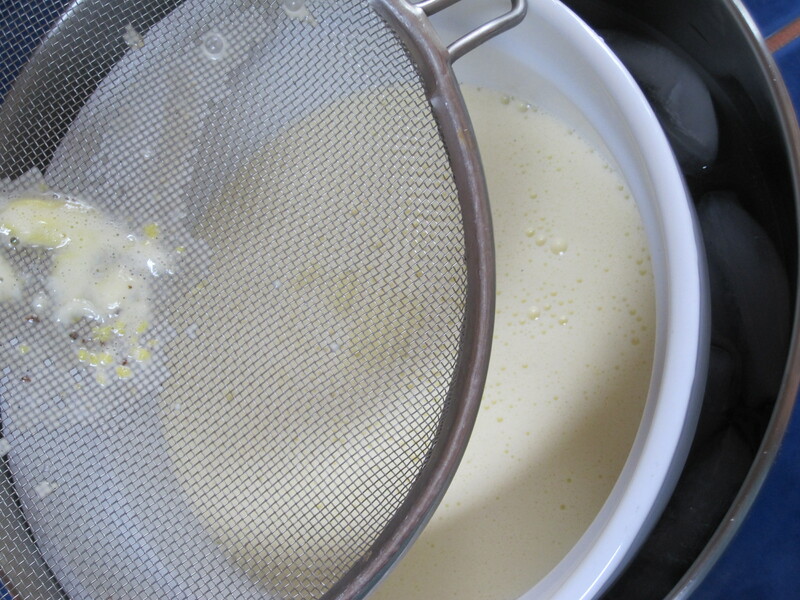 Pour 1 cup of hot cream mixture into eggs and whisk to combine. Pour egg mixture into cream mixture and add scraped vanilla seeds and salt. Heat to 180 degrees then remove from heat. Strain mixture into a bowl sitting in an ice bath. Once custard cools, cover and refrigerate until very cool. Process in ice cream maker according to manufacturer’s recommendations. Wash and dice the rhubarb. Halve half of the cherries and quarter the other half. 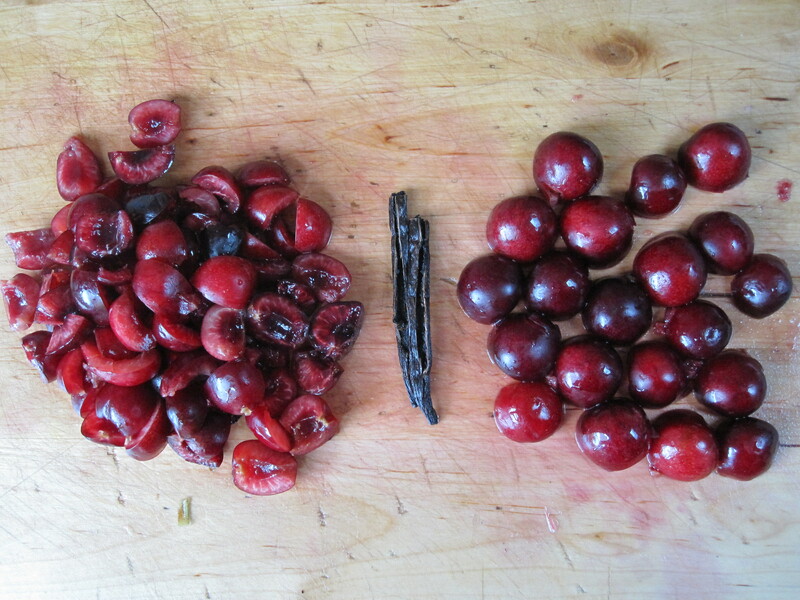 In a medium pot, place the quartered cherries, half the rhubarb, the sugar, water, and vanilla pod. Heat to a boil, then simmer until mixture is syrupy and beginning to thicken. Add the reserved rhubarb and cherry halves. Cook for another couple of minutes until fruit is heated through. Remove from heat and store in a sterile jar in refrigerator. Serve hot or cold on ice cream or waffles. Our ice cream maker sits lonely, too. Time to pull it out and this looks like a terrific way to start the season. 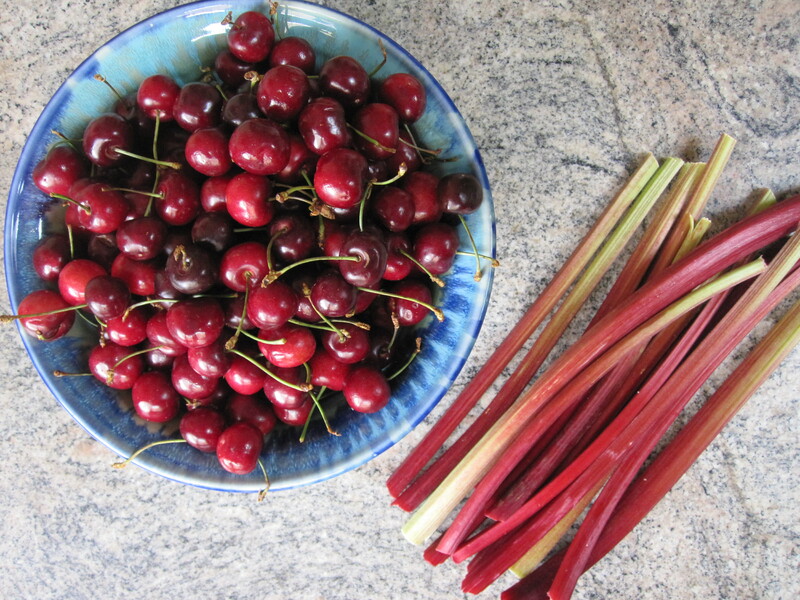 I like your cherry and rhubarb mix of fruit. I hope your son is feeling better. I’m sure this ice cream was good medicine! not work now….but this did bring back another family memory !